Be the first to share your favorite memory, photo or story of Maggie. This memorial page is dedicated for family, friends and future generations to celebrate the life of their loved one. 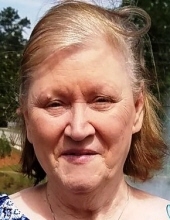 Maggie Bell Covington, 71, passed away November 19, 2018 at her home in McDonough, GA.
She was preceded in death by her husband of 51 years, Oscar Covington. Maggie is survived by her two daughters, Bridgett Covington and Angela Hallford; her son in law Shane Hallford; her grand-daughters, Shalane Richardson, Savannah Wright, and Alyssa Brown and their spouses; many nieces and nephews; and several close friends. Maggie met her only husband, Oscar, in Knoxville, TN as a teenager. She spent her life working retail in Tennessee and Georgia. Maggie and Oscar moved in with their daughter, Angela Hallford, and her family over 20 years ago and she thoroughly enjoyed being around her grand-daughters every day. They would often travel Knoxville to visit with their daughter Bridgett, family and friends. She was a very loving person, with a huge heart and beautiful smile, that everyone enjoyed being around. She would do anything in her power to help out a person in need in any way possible. The family will receive friends on Friday, November 23, 2018 from 1 until 2 p.m. at Click Funeral Home Middlebrook Chapel, 9020 Middlebrook Pike, Knoxville, Tennessee 37923 followed by a funeral service at 2pm. To send flowers or a remembrance gift to the family of Maggie Bell Covington, please visit our Tribute Store. "Email Address" would like to share the life celebration of Maggie Bell Covington. Click on the "link" to go to share a favorite memory or leave a condolence message for the family.